A sweet & salty twist on banana bread. Our classic banana bread is baked with organic flour, real butter, fresh eggs, cane sugar, a touch of Madagascar vanilla and two ultra ripe bananas. It's great, a strong house built of nostalgia and seriously good flavor. The master bakers at Zingerman's Bakehouse have taken that banana bread base and turned it up to eleven with the addition of a salted pecan praline topping. The caramelized pecans add a salty-sweet crunch that's hard to resist. Wrapped in tissue, each loaf comes packed in its own colorfully illustrated box. Close, but no nuts? 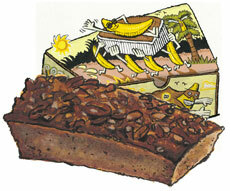 Try our banana bread without any nuts in its simplest, classic recipe, or studded with rich chunks of chocolate.